New cookbook day is like Christmas. Do you feel that way, too? Gazing at the cover and wondering what treasures await inside...very much like seeing those wrapped presents under the Christmas tree. 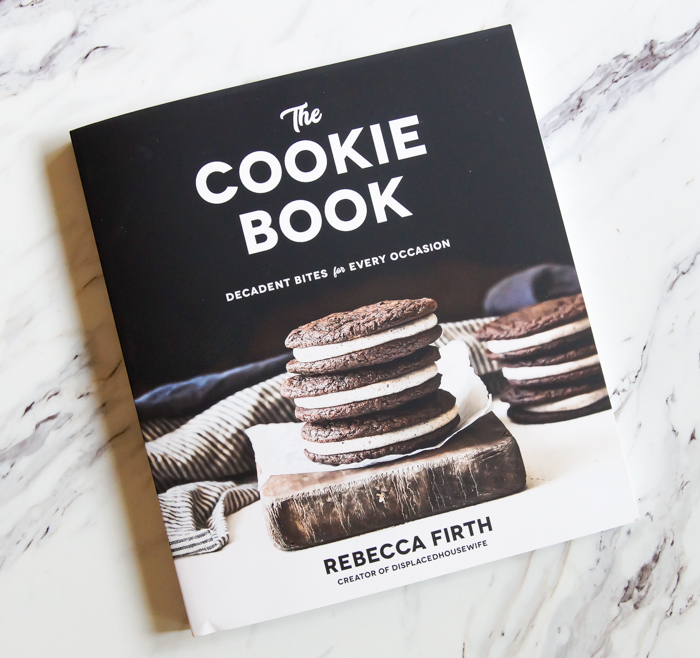 When the publisher of The Cookie Book: Decadent Bites for Every Occasion by Rebecca Firth sent me a copy, I was beyond thrilled. I actually felt like a live version of the "praise hands" emoji. The cover alone had me swooning. Is there any question that I want to make them ALL?!? 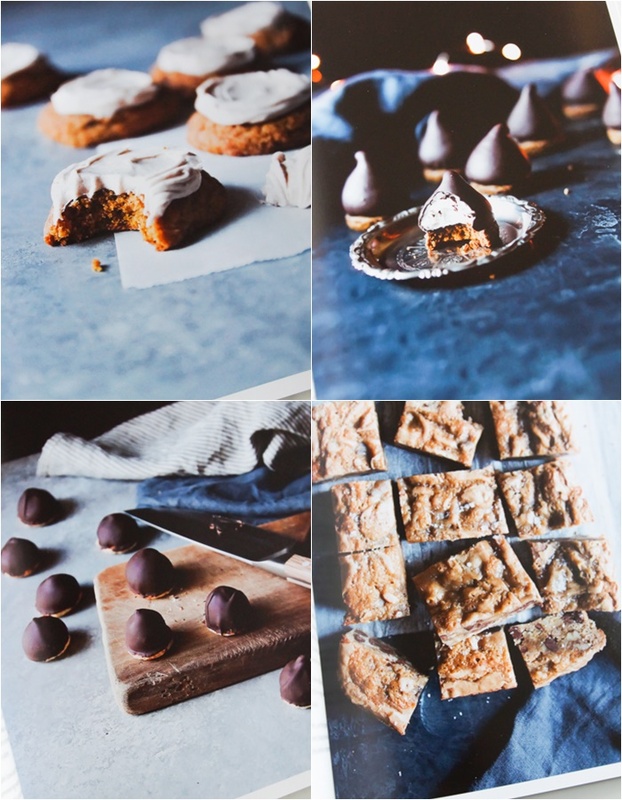 Flipping through the pages, I knew it would be almost impossible to choose which of the incredible-sounding cookie recipes to try first. 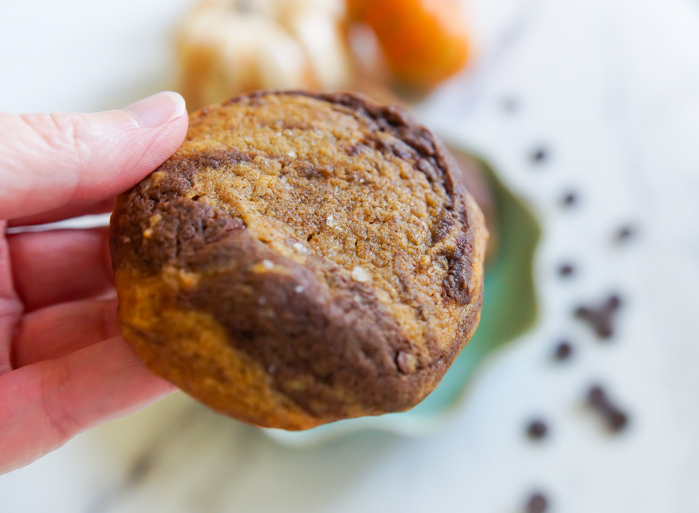 And then I saw it...Chocolate Pumpkin Swirl Cookies. 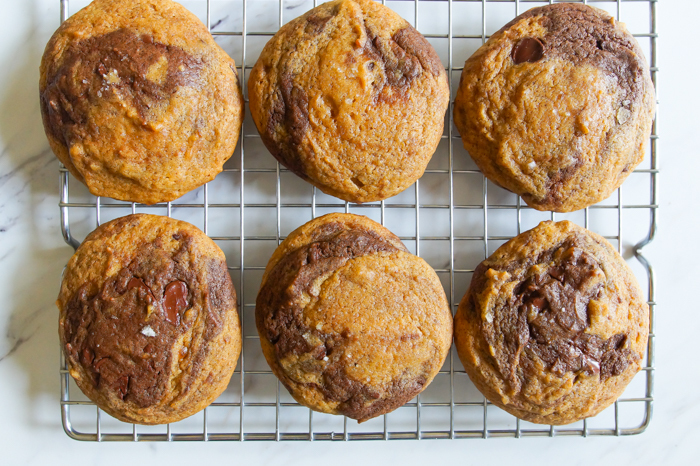 Basically, the cookies of my dreams. 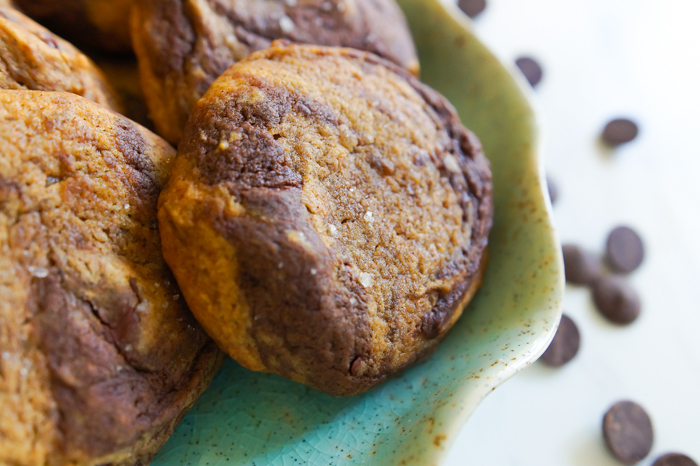 The cookies are soft, puffy, nicely spiced, and flecked with bits of melty chocolate. 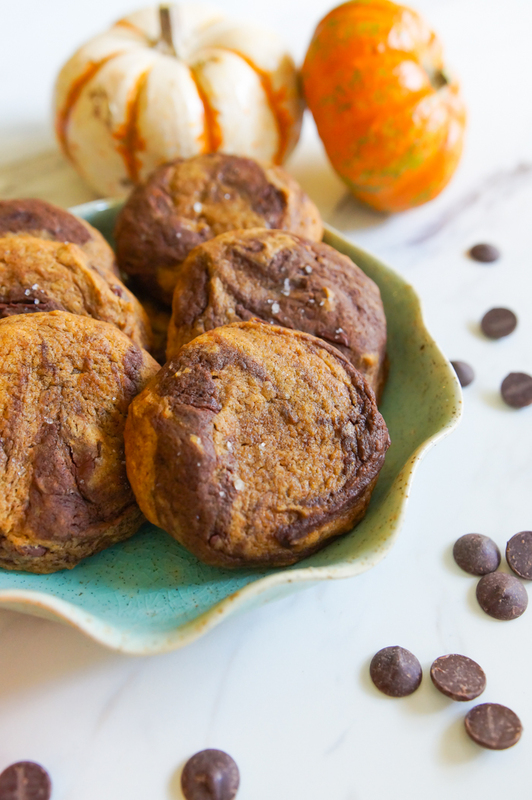 They're THE cookie for a pumpkin and chocolate lover. I speak from experience. 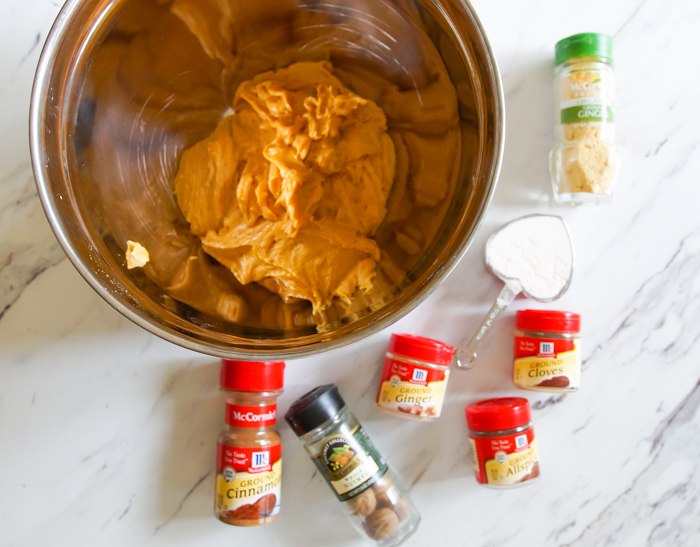 You start by making a base pumpkin dough. It's then divided in half. Into one half of the dough goes Dutch-process cocoa and chopped chocolate. 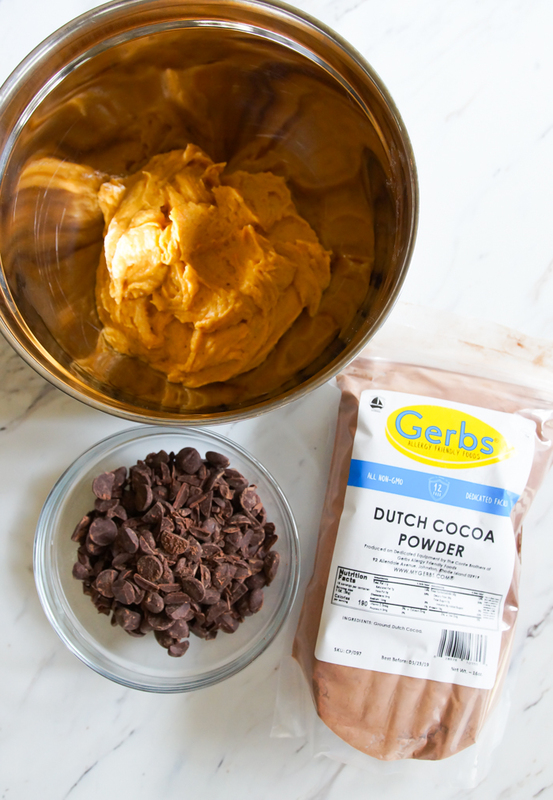 (I used Gerbs cocoa...find it on Amazon...on the recommendation of Stella Parks and it's superb.) 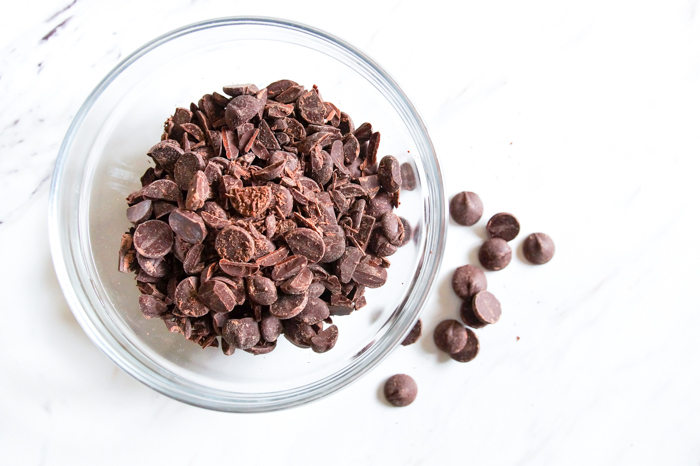 For the chopped chocolate in the recipe, I roughly chopped Ghirardelli bittersweet chocolate chips. It worked like a charm - and since I didn't have a bar of dark chocolate on hand, it saved me a trip to the store. Win/win. A little flour and fall spices get stirred into the other half of the dough. Both doughs are refrigerated to make the next step easier - the rolling. Now, I'll confess that I found this a bit messy. My hands were covered in sticky dough. I mean, it was totally WORTH it, but don't say I didn't warn you. I probably would not have kids help with this part of the recipe. 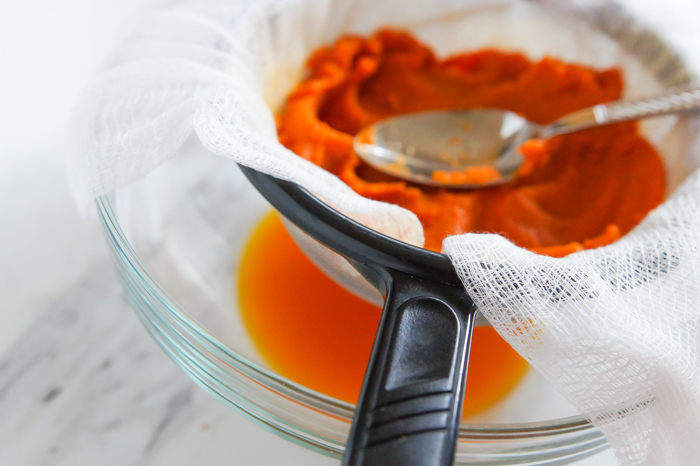 As I've been doing for all of my pumpkin recipes lately, I strained the pumpkin before using. It takes out a lot of the liquid and leaves a firmer consistency pumpkin. I'm so happy I did that here as the dough, even after refrigerating is very soft. Draining the excess liquid helped, I think. The recipes call for rolling 4 teaspoons of dough together to get the swirl effect. My smallest cookie scoop is about 2 teaspoons, so my cookies were twice the size. Instead of the yield of 63 cookies, I ended up with only 22. That's ok. They are big and glorious. As they say, everything is bigger in Texas...even cookies. Oh! I'd be remiss if I didn't point out the sprinkling of sea salt on top. I used my favorite, fleur de sel. 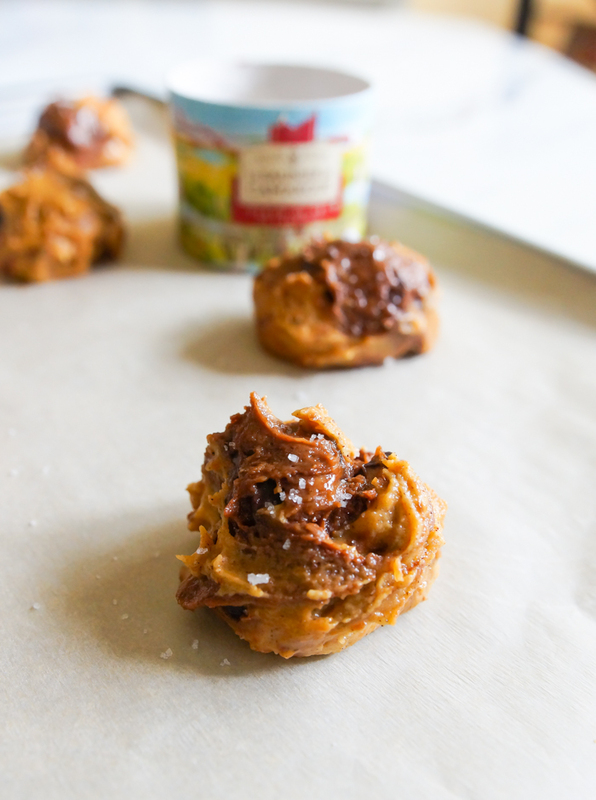 It's the perfect finish to these perfect cookies. Mix the butter and sugars until fluffy and combined, about 4 minutes. Beat in the oil and strained pumpkin puree. Beat in the eggs, one at a time, scraping down sides and bottom of the bowl as needed. Mix in the vanilla. In another bowl, whisk the 2 1/3 cups flour, salt, baking powder, and baking soda. Add to the pumpkin mixture and mix on low just until combined. Divide the dough evenly between two bowls. To one bowl, add the remaining 1/4 cup flour and spices. The the other, add the cocoa powder and chopped chocolate. Refrigerate both bowls of dough for 45 minutes or more. 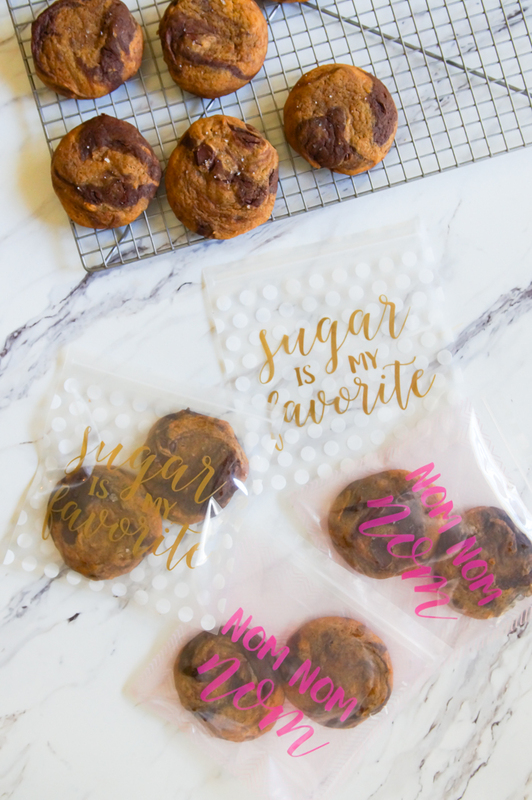 Bake the cookies for 11-12 minutes. 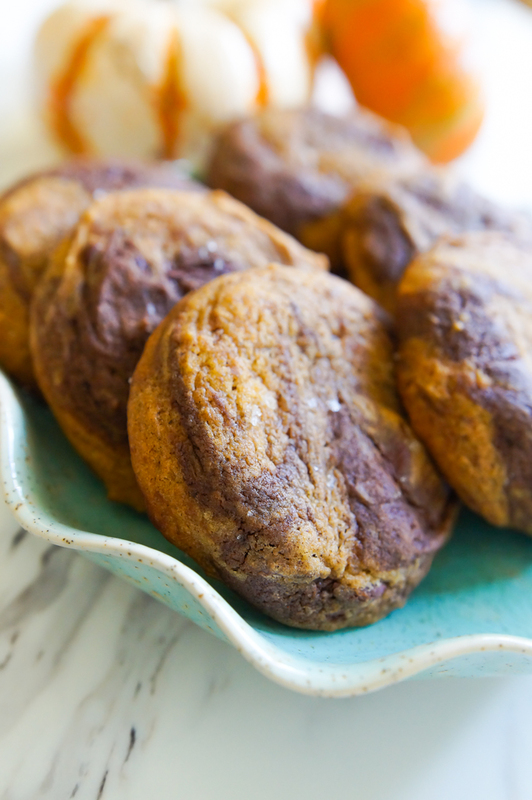 The cookies should be soft in the centers, but not raw. Cool on the sheet for 5 minutes, then transfer to a cooling rack to cool completely. Also, go get that book!!! These look fantastic. I think I have almost everything but the bittersweet chocolate! And those jackets would be amazing!! Orange and brown! Yes!!! Oh.My.Goodness. These look amazing!! Can't wait to try them! Cleanliness is the secret of the beauty of the house, which gives it a special luster, the house needs to do a periodic cleaning because it is exposed to dust, dirt and stains, which shows it distorted and bad, and does not leave the process to the lady of the house because it needs specialists trained carefully on the cleaning work of external and internal interfaces and ceilings Walls and furniture in the past. A house cleaning company in Buraidah has excelled in cleaning houses, palaces and private offices so do not exhaust yourself. Dear customer in search, it is a company that has special capabilities in good cleaning and provides you with a variety of services.